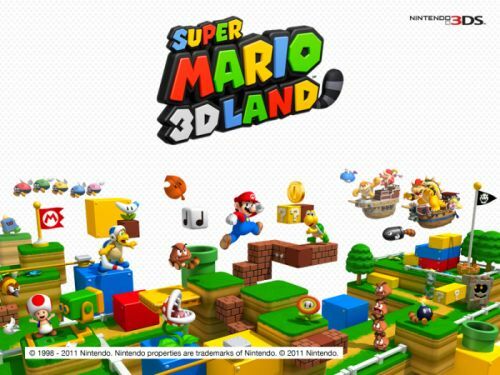 Loving The 3DS #SuperMario #3DS #Nintendo – Nomadic Gamers, eh! I’ve wanted a 3DS for quite some time, and my other half finally gave in and bought one for me about two weeks ago. I’ve had a LOT of fun playing with it daily, and it feels really nice to have a hand held that’s “just for me” as it were. I’m picky about my games – and nintendo offers a nice collection of games that I’ll actually play. There is also an XBox and a PS3 here, but the last game I played on the XBox was Fable 3, and I don’t remember the last time I used the PS3 for more than just Netflix. I used to play Mario games with my Mom growing up, while my Dad was doing his late night radio show. I have fond memories of eating ribs together and getting my younger brothers to beat the harder levels for us. Of course one of my first purchases for the 3DS would have to be a mario game. Actually it was more like my 3rd purchase, but I’ll talk about the other ones in a bit. I am absolutely loving this game. It was a bit hard for me to get used to the 3D option when I first started playing, but as long as I’m not playing hours at a time (and these days I never am) it doesn’t seem to bother me too much. I can’t get over how amazing things look with the 3D option turned on, it really IS 3D! It makes my mind boggle, to put it bluntly. Looking at the screen without needing any glasses at all is wonderful. I’ve only beat the first world so far, but I just got the game a few days ago, so that’s not bad. I don’t have a very large collection of games yet, my other two favorites are Super Scribblenauts (and this is for the DS not the 3DS), and Harvest Moon. The 3DS was a bundle that also came with the newest Zelda game, but I haven’t played it yet so I don’t really have any idea about how it is. I’ve never played any Zelda games, actually. My other half has though and seems to enjoy it quite a bit. Aside from the fun I’m having with games, I really like the camera and camera options. I took the 3DS with me to a hockey game, and red turns out VERY well in 3D, it just so happens that hockey jerseys for my home team come in red, and so now I have a bunch of 3D images of that game saved to the SD card that came with the device. I have also been having an incredible time playing with the “AR Cards” that comes with the 3DS. These cards are just amazing. You place a flat piece of card board on a table with a question mark image on it and using the 3DS suddenly that question mark comes to ‘life’ and all of these amazing 3D images happen based around it. Suddenly you’re not looking through a screen at a camera but you’re fighting a dragon that’s popped up out of your coffee table. Maybe it’s just that simple things amuse me, but I could stare at these illusions for hours and never tire of them. I have five cards right now, and I’m wondering if there’s any way to obtain more. I’ve also played with Netflix a bit, but the load time and screen reaction is quite slow, so I’d rather just watch it on the Ipad 2 or my PC. Once I got the show I wanted to watch playing it was nice and smooth, but I just felt that the interface was a bit lacking. Over all? I’m incredibly pleased with the purchase. I love wandering around with the device in my purse, hoping to come across other “mii” who have streetpass on. I’ve only found a few so far, but I don’t venture very far from home so that is probably why. I’m thinking of picking up a pokemon game, I’ve always been interested and have played the card game a few times but never any of the video games. I was thinking of the black or white pokemon games that are out there. Anyone have a suggestion? I know lots of people who agree, but its mostly because those games were your childhood if you grew up in the 90s. That shouldn’t stop you from enjoying new ones though.